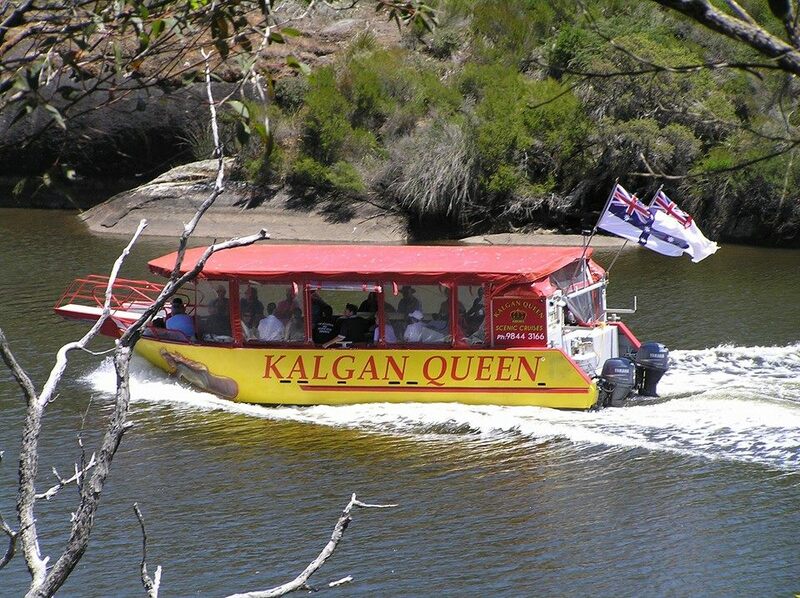 Albany Australia Boat Tours Cruises Kalgan Queen Scenic Cruises. Albany is home to the award winning Kalgan Queen Riverboat trip which is a four hour sheltered water cruise that departs every day at 9am. 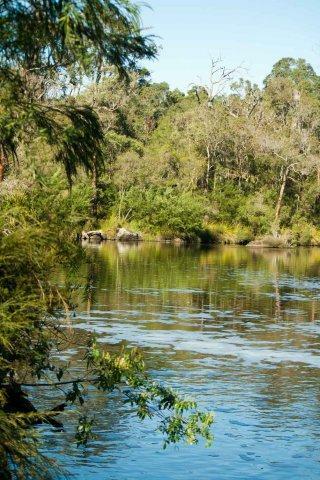 You can learn more about Albany its history, dreamtime and wildlife than some people do in a life time. Did I mention it's a fun boat trip! Booking and information. 9844 3166 7am 7pm 7days. 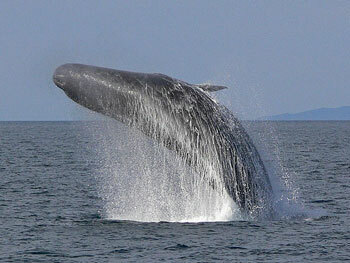 Please be my guest as I show you our cruise and introduce you to our wild life friends. Bookings and Information... Call 08 9844 3166 7am til 7pm Adult fare $95.00 Aussie Senior $85.00 Children 4 to 14 $60 Family ticket 2 adults plus 2 children $270. For a full four hours. Oyster Harbour is the most sheltered Harbour in Albany which is near Emu Point. 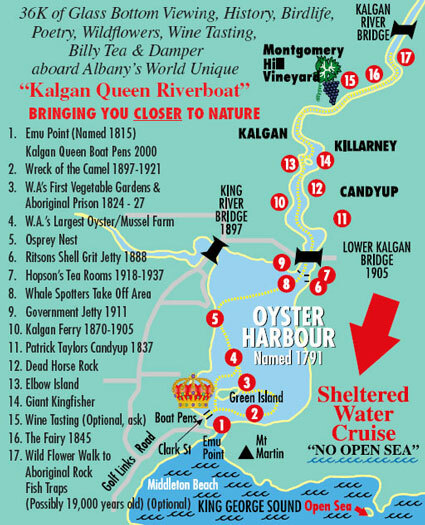 This is where Kalgan Queen Riverboat, tours, cruises and Albany WA Australia Clydesdale Horse Wagon Tours depart from. 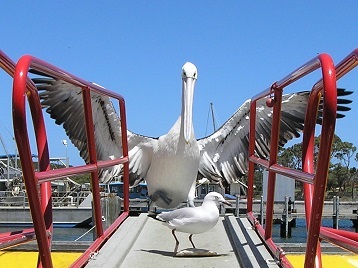 The Harbour is good for fishing, bird watching and wildlife and also home to one of only four places where Pelicans breed in WA. 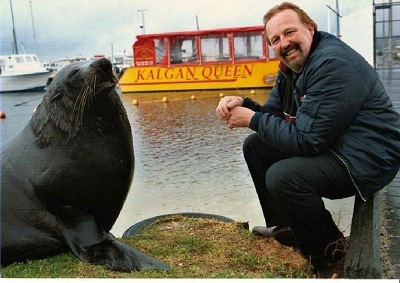 The Kalgan River which flows into Oyster Harbour is one of the oldest Rivers in the World and home to the Kalgan Queen Riverboat. Many people believe its scenic beauty and wildlife far exceed the French Riviere des Fancaise after which it was named in 1803 by the French explorer Nicholas Baudin.During the late nineteenth and early twentieth century’s the Albany served as a gateway to the Eastern Goldfields and for many years was Western Australia’s only deep water port, making it a place of importance for shipping services between the UK and its Australian colonies. The construction of Fremantle Harbour in 1893 saw its importance as a port decline. After which Albany industries turned primarily to agriculture and timber and, later, whaling and tourisum. Unlike Perth and Fremantle WA, Albany was a strong supporter of Federation in 1901. 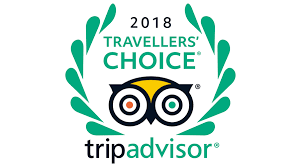 Today Albany Australia is recognised as having the most scenic coastline in AustraliaTourists love the Kalgan Queen Riverboat trip and the Horse drawn Wagon tour are favourite Attractions. Albany WA is the top spot from which to explore the south west of the state and is recognised for its natural beauty and preservation of heritage. With the exception of the Esplanade Hotel. Albany WA is the oldest permanently settled town in Western Australia, predating Perth and Fremantle by some two years. Despite what the Tours in Perth tell you! Click ALBANY BEACHES for more infomation and pictures. Albany Australia is the home of the Anzac legend, being the last port of call for troopships departing Australia in the First World War. Ships carrying the Australian Imperial Force and the New Zealand Expeditionary Force (later known collectively as Anzacs to Europe to join World War I gathered at Albany Australia in October 1914. They 38 ships departed in convoy on 1 November 1914. There were more than 30,000 troops with over 7500 horses. The memorial to the Desert Mounted Corps is on top of Mount Clarence. The memorial consists of a statue of an Australian mounted soldier helping a New Zealand soldier whose horse has been wounded. There is a wall bearing the words "Lest We Forget". A dawn service was started in Albany Australia by a Church of England Priest Called the Reverend Arthur White Today several thousand people participate in this service each year. In Herberton Nth Queensland there is a grave just marked. A Priest. Next to the grave a marker which reads, quote: - Adjacent to, and on the right of this marker, lies the grave of the late Reverend Arthur Ernest White, a Church of England clergyman and padre, 44th Battalion, First Australian Imperial Force. On 25th April 1923, at Albany in Western Australia, the Reverend White led a party of friends in what was the first ever observance of a Dawn parade on ANZAC Day, thus establishing a tradition which has endured, Australia wide ever since. Any information about Albany can be found by clicking on the top buttons do enjoy Albany Western Australia it is very special. The secret ingredient is naturally soured milk. See how to sour milk just below. For the Basic Damper recipe swap the amount of water shown for sour milk and your Damper will come out much richer. 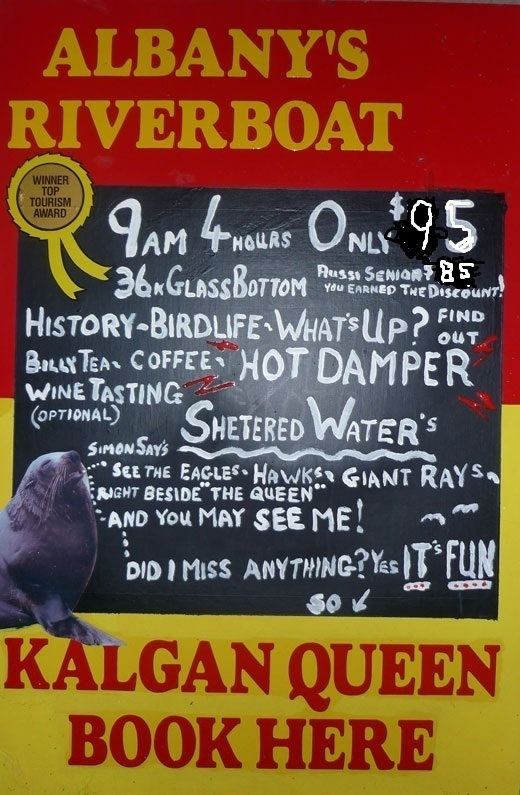 Do try a free game of pacman then press return to damper page button below when you are ready, enjoy your Albany Australia Damper! The secret ingredient is naturally soured milk, take a little milk out of a bottle to let some air in, put the top back on the container. Use a clear milk bottle so you can see the milk, leave it at room tempreatare untill it is sour, when it starts to clear at the bottom and thicken at the top shake it up and you have naturaly soured milk, the more the better! Our Grandparents used this for Scones and Sour Dough as well. Dont sour with vinegar or lemon as the Damper wont rise. Have a game of packman on us! Good Luck. [Remember it was the spider that got little Miss Muffet not the Curds and Way or naturally soured milk as we now call it! Middleton Beach, Albany Australia: The city centre of Albany is located between the hills of Mount Melville and Mount Clarence, which look down into Princess Royal Harbour. There are many beaches surrounding Albany which are great attractions, with Middleton Beach being the closest to the town centre. 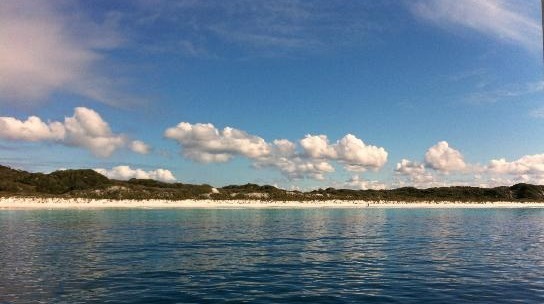 Popular beaches include Middleton Beach, Frenchman's Bay and Muttonbird Island. CLICK FOR ALBANY BEACHES WITH PICTURES. It is 408 kilometres (254 miles] south-southeast of the state capital, Perth, to which it is linked by the Albany Highway and the Highway 1 (a less direct but more scenic route). The main industries of Albany WA consist of tourism, fishing and agriculture; although before the 1950s whaling was one of the major sources of income and employment for the population. The Whaling Station, which closed operations in 1979, has now been converted to a museum of whaling, and features one of the 'Cheynes' whale chasers that were used for whaling in Albany. The station was the last operating whaling station in the Southern Hemisphere at the time of closing. Albany WA also has a number of historic tourist sites including the Museum, Albany Convict Gaol, The Princess Royal Fortress (commonly known as The Forts), Patrick Taylor Cottage, and ("is the oldest dwelling in Western Australia, c1832"). 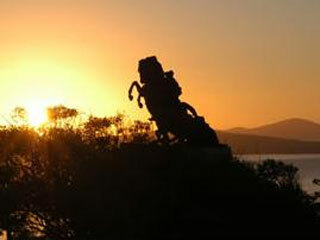 Albany has a great deal of historical significance to Western Australia. Natural sights and attractions are also numerous, especially the rugged coast which includes the Natural Bridge and the Gap. The beaches have pristine white sand. The destroyer HMAS Perth was sunk in King George Sound in 2001 as a dive wreck Albany is also close to two mountain ranges, the Porongurup’s and Stirling Ranges. Albany Australia is also the southern terminus of the Bibbulmun Track walking trail in WA. Which is one of the great attractions. [ Albany is home to HMAS Albany (based in Darwin) and the adopted home port of the Royal Australian Navy frigate HMAS Anzac. Other warships frequently visit Albany. Albany is a subregion of the Great Southern region of Western Australia its focal point being the town of the same name. Albany’s climate is maritime, strongly shaped and moderated by the Southern Ocean; the standard description is that it is Mediterranean, with moist, cool winters and warm, dry summers. Diurnal temperature range is minimal and moderate humidity in summer assists ripening by reducing stress on the vines. Soil conditions: lateritic gravelly, sandy loams or sandy loams derived directly from granite and gneissic rocks. Lat: 35 02’S; Alt: 75 m; Hdd: 1495; Gsr: 303 mm; Mjt: 19C; Harvest: Early Mid-March to end April; Chief Viticultural Hazard: Birds. Western Australia is a state of Australia, occupying the entire western third of the Australian continent. Australia’s largest state Western Australia and the second largest subnational entity in the world, it has 2.2 million inhabitants (10% of the national total), 85% of whom live in the southwest corner of the state. The state's capital city is Perth. The people of WA are often colloquially referred to as sandgropers, the common name of an insect found on sand dunes around Perth WA. WA is bounded by South Australia and the Northern Territory to the east, and the Indian Ocean to the west and north. In Australia, the body of water south of the continent is officially gazetted as the Southern Ocean, whereas the International Hydro graphic Organization (IHO) designates it as part of the Indian Ocean. The bulk of, WA, consists of the extremely old Yilgarn craton and Pilbara craton which merged with the Deccan Plateau of India, Madagascar and the Karoo and Zimbabwe cratons of Southern Africa, in the Archean Eon to form rUr, one of the oldest supercontinents on Earth (3,200 – 3,000 million years ago). Because the only mountain-building since then has been of the Stirling Range, WA, with the rifting from Antarctica , the land is extremely eroded and ancient, with no part of the state above 1,245 metres (4,085 ft) AHD (at Mount Meharry in the Hamersley Range of the Pilbara region). Most parts of the state form a low plateau with an average elevation of about 400 metres (1,200 ft), very low relief, and no surface runoff. This descends relatively sharply to the coastal plains, in some cases forming a sharp escarpment (as with the Darling Range/Darling Scarp near Perth ).WA. The extreme age of the landscape has meant that the soils are remarkably infertile and frequently laterised. Even soils derived from granitic bedrock contain an order of magnitude less available phosphorus and only half as much nitrogen as soils in comparable climates in other continents. Soils derived from extensive sand plains or ironstone are even less fertile, being even more devoid of soluble phosphate and also deficient in zinc copper, molybdenum and sometimes potassium and calcium. The infertility of most of the soils has required heavy inputs of chemical fertilisers, particularly superphosphate, insecticides and herbicides, which—with the ensuing damage to invertebrate and bacterial populations, and compaction of soils through heavy machinery and hoofed mammals—has done great damage to the fragile soils of WA. Large-scale land clearing for agriculture and forestry has damaged habitats for native flora and fauna in WA. As a result, the South West region of the stateof WA, has a higher concentration of rare, threatened or endangered flora and fauna than many areas of Australia , making it one of the world's biodiversity "hot spots". Large areas of the state's wheatbelt region have problems with dryland salinity and the loss of fresh water. The southwest coastal area of WA has a Mediterranean climate and was originally heavily forested, including large stands of the karri, one of the tallest trees in the world. This agricultural region of WA is in the top nine terrestrial habitats for terrestrial biodiversity, with a higher proportion of endemic species than most other equivalent regions. Thanks to the offshore Leeuwin Current the area numbers in the top six regions for marine biodiversity, containing the most southerly coral reefs in the world. Average annual in rainfall in WA varies from 300 millimetres (12 in) at the edge of the Wheatbelt region to 1,400 millimetres (55 in) in the wettest areas near Northcliffe , WA , but in the months of November to March evaporation exceeds rainfall, and it is generally very dry. Plants must be adapted to this as well as the extreme poverty of all soils. A major reduction in winter rainfall has been observed since the mid-1970s, with a greater number of extreme rainfall events in the summer months. The central four-fifths of the state is semiarid or desert and is lightly inhabited with the only significant activity being mining. Annual rainfall averages 200–250 millimetres (8–10 in), most of which occurs in sporadic torrential falls related to cyclone events in summer months. An exception to this is the northern tropical regions of WA. The Kimberley , WA has an extremely hot monsoonal climate with average annual rainfall ranging from 500 to 1,500 millimetres (20–60 in), but there is a very long almost rainless season from April to November. Eighty-five percent of the state's runoff occurs in the Kimberley Western Australia , but because it occurs in violent floods and because of the insurmountable poverty of the generally shallow soils, the only development has taken place along the Ord River. Occurrence of snow in the state is rare, and typically only in the Stirling Range near Albany WA , as it is the only mountain range far enough south and with sufficient elevation. More rarely, snow can fall on the nearby Porongurup Range . Snow outside these areas is a major event; it usually occurs in hilly areas of South Western Australia. The most widespread low-level snow occurred on 26 June 1956 when snow was reported in the Perth Hills WA, as far north as Wongan Hills and as far east as Salmon Gums. However, even in the Stirling Range, snowfalls rarely exceed 5 cm (2 in) and rarely settle for more than one day. The highest observed maximum temperature of 50.5 °C (122.9 °F) was recorded at Mardie, Pilbara, 61.6 kilometres (38.3 mi) from Barrow Island on 19 February 1998 . The lowest minimum temperature recorded was -7.2 °C (19.0 °F) at Eyre Bird Observatory on 17 August 2008 . The Flora of WA, comprises 9437 published native vascular plant species of 1543 genera within 226 families, there are also 1171 naturalised alien or invasive plant species more commonly known as weeds. In the south west region are some of the largest numbers of plant species for its area in the world. William Henry Harvey published a five-volume Phycologia Australia, which was issued in parts between 1858 and 1863. He earned the title of father of Australian Phycology. His main collection is in the herbarium of Trinity College Dublin; there is also a large collection of his specimens in the Ulster Museum, Belfast. History of and Aboriginal history of WA. The first inhabitants of Australia arrived from the north approximately 40,000 to 60,000 years ago. Over thousands of years they eventually spread across the whole landmass. These Indigenous Australians were well established throughout WA by the time of European explorers began to arrive in the early seventeenth century. The first European to visit WA was a Dutch explorer, Dirk Hartog who on 26 October 1616 landed at what is now known as Cape Inscription, Dirk Harthog Island. For the rest of the 17th century, many other Dutch travellers enountered the coast, usually unintentionally. 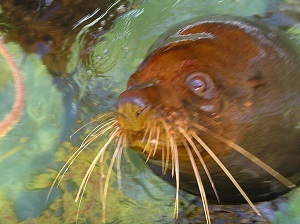 By the late 18th century, British and French sailors had begun to explore the WA coast. The origins of the present state of WA began with the establishment of a British settlement at King George Sound in 1826 (later named Albany from 1832). The settlement was founded in response to British concerns about the possibility of a French colony being established on the coast of WA. In 1829, Captain James Stirling established the Swan River Colony, on the Swan River, WA. By 1832, the British settler population of the colony had reached around 1,500. The two separate townsites of the colony developed slowly into the port city of Fremantle and the state's capital, Perth WA. Population growth was very slow until significant discoveries of gold were made in the 1890s around Kalgoorlie , WA . In 1896, the WA Parliment authorised the raising of a loan to construct a pipeline to transport five million gallons of water per day to the goldfields of WA. The pipeline, known as the Goldfields Water Supply Scheme, was completed in 1903. C.Y. 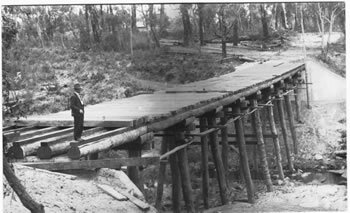 O'Connor, Western Australia 's first engineer-in-chief, designed and oversaw the construction of the pipeline. It carries water 530 km (330 miles) from |Perth to Kalgoorlie , WA and is attributed by historians as an important factor driving the state's population and economic growth. Following a campaign led by Forrest, residents of the Swan River Colony voted in favour of federation, resulting in WA officially becoming a state on 1 January 1901. The first inhabitants of what is now WA were Indigenous Australians, from a wide variety of language and kin groups—for example, the Nyungah in the south west, the Wongai in the central desert, the Malkana in Shark Bay. These groups continue to form the majority of the local population in the remotest parts of the state such as the Kimberley, WA. Europeans began to settle permanently in 1826 when Albany was claimed by Britain in order to forestall French claims to the western third of the continent. Perth was founded as the Swan River Colony in 1829 by British and Irish settlers, though the outpost languished, eventually requesting convict labour to augment its population. In the 1890s, interstate migration resulting from a mining boom in the Goldfields region resulted in a sharp population increase. Western Australia did not receive significant flows of migrants from Britain , Ireland or elsewhere in the British Empire until the early 20th century when local projects. 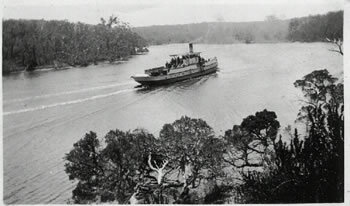 Such as the Group Settlement Scheme of the 1920s which encouraged farmers to settle the southwest increased awareness of WA third as a destination for colonists. the WA economy is more capital-intensive than all the other states. There has been strong growth in the services (finance, insurance and property) and construction sector, which have increased their share of economic output. Western Australia 's overseas exports accounted for 36% of the nations total. The state's major export commodies include iron-ore, alumina, crude oil and liquefied natural gas (LNG), nickel, gold, ammonia, wheat, wool, and live sheep and cattle. WA is a major extractor of bauxite, which is also processed into alumina at three refineries providing more than 20% of total world production. It is the world's third-largest iron-ore producer (15% of the world's total) and extracts 75% of Australia 's 240 tonnes of gold. Diamonds are extracted at Argyle diamond mine in far north of the Kimberley , West Australia , and region. Coal mined at Collie is the main fuel for baseload electricity generation in the state's south-west. Agricultural production in WA is a major contributor to the state and national economy. Although tending to be highly seasonal, 2006-07 wheat production in WA was nearly 10 million tonnes, accounting for almost half the nation's total. and providing $1.7 billion in export income. Other significant farm output includes barley, peas, wool, lamb and beef. There is a high level of overseas demand for imports of live animals from WA, driven mainly by South East Asia 's feedlots and Middle Eastern countries, where cultural and religious traditions and a lack of storage and refrigeration facilitites favour live animals over imports of processed meat. Approximately 50% of Australia 's live cattle exports come from Western Australia . Resource sector growth in recent years has resulted in significant labour and skills shortages, leading to recent efforts by the state government to encourage interstate and overseas migration. According to the 2006 census, the median individual income was A$500 per week in WA (compared to A$466 in Australia as a whole). The median family income was A$1246 per week (compared to A$1171 for Australia ). Recent growth has also contributed to significant rises in average property values in 2006, although values plateaued in 2007. Perth property prices are still the second highest in Australia behind Sydney , and high rental prices continue to be a problem. Located south of Perth, WA the heavy industrial area of Kwinana has the nation's largest oil refinery which produces petrol and diesel for local consumption, along with iron, alumina, and nickel processing plants, port facilities for grain exports, and support industries for mining and petroleum such as heavy and light engineering, and metal fabrication. Shipbuilding (eg Austal Ships) and associated support industries are found at nearby Henderson , just south of Fremantle , WA . Significant secondary industries include cement and building product manufacturing, flour milling, food processing, animal feed production, automotive body building, and printing. In recent years, tourism in WA has grown in importance, with significant numbers of visitors to the state coming from the UK and Ireland (28%), other European countries (14%) Singapore (16%), Japan (10%) and Malaysia (8%). Revenue from tourism is a strong economic driver in many of the smaller population centres outside of Perth , WA , especially in coastal locations. WA has a significant fishing industry. Products for local consumption and export include Western Rock Lobsters, prawns, crabs, shark and tuna, as well as pearl fishing in the Kimberley region of the state. Processing is conducted along the West Coast. Whaling was a key marine industry but ceased at Albany in 1978. WA was granted self-government in 1889 with a bicameral Parliament located in Perth , WA . Consisting of the Legislative Assembly (or lower house), which has 59 members; and the Legislative Council (or upper house), which has 36 members. Suffrage is universal and compulsory for citizens over 18 years of age. With the federation of the Australian colonies in 1901.WA, became a state within Australia 's federal structure; this involved ceding certain powers to the Commonwealth (or Federal) government. In accordance with the Constitution; all powers not specifically granted to the Commonwealth remained solely with the State, however over time the Commonwealth has effectively expanded its powers through increasing control of taxation and financial distribution. Whilst the sovereign of WA, is the Queen of Australia (Queen Elizabeth II, and executive power nominally vested in her State representative the Governor. (currently Ken Michael, executive power rests with the premier and ministers drawn from the party or coalition of parties holding a majority of seats in the Legislative Assembly. The current Premier is Colin Barnett. Secessionism has been a recurring feature of WA's political landscape since shortly after European settlement in 1826. WA was the most reluctant participant in the Commonwealth of Australia. WA did not participate in the earliest federation conference. Longer-term residents of Western Australia were generally opposed to federation; however, the discovery of gold brought many immigrants from other parts of Australia . It was these residents, primarily in Kalgoorlie WA but also in Albany who voted to join the Commonwealth, and the proposal of these areas being admitted separately under the name Auralia was considered. In a referendum in April 1933, 68% of voters voted for the state to leave the Commonwealth of Australia with the aim of returning to the British Empire as an autonomous territory. The State Government sent a delegation to Westminster , but the British Government refused to intervene and therefore no action was taken to implement this decision. Education in WA consists of one year of pre-school at age 5, followed by seven years of primary school education. At age 13, students begin five years of secondary education. The final two years of secondary education are currently changing to compulsory. All students who completed Year 10 in 2005 are now required to undertake further studies in Year 11. Students are required to complete the year in which they turn 16 (usually Year 11). Commencing in 2008 all students will be required to complete 12 years of study before leaving school. Students will have the option to study at a TAFF college in their eleventh year or continue through high school with a vocational course or a specific University entrance course. The universities in WA are Curtin University of Technology, Murdoch University , Edith Cowan University , University of Notre Dame and the University of Western Australia. Western Australia has two daily newspapers: the independent tabloid The West Australian Countryman and The Kalgoorlie Miner. Also published is one Sunday tabloid newspaper, News Corporation The Sunday Times. There are also 17 weekly Community Newspapers with distribution from Yanchep in the North to Mandurah in the South. The interstate broadsheet publication The Australian is also available, although with sales per capita lagging far behind those in other states. With the advent of the Internet, local news websites like WA today, which provide free access to their content, are becoming a popular alternative source of news. Other on line publications from around the world like the New South Wales based The Sydney Morning Herald and The Australian are also available.